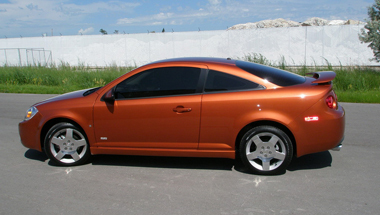 The Chevy Cobalt is a compact car introduced by Chevrolet in 2004 for the 2005 model year. The Cobalt replaced both the Cavailer and the Prizm as Chevrolet's compact car. The Cobalt was available as both a coupe and sedan, and is based upon the Gm Delta platform also shared with the Chevrolet HHR, Pontiac G5, Astra, and the Opel Zafira. All Cobalts were manufactured at GM's Lordstown Assembly plant in Ohio. The Chevrolet is built in multiple locations around the world including Lordstown Assembly. Chevrolet Cobalt was an example of America's ability to build a decent compact automobile as well. 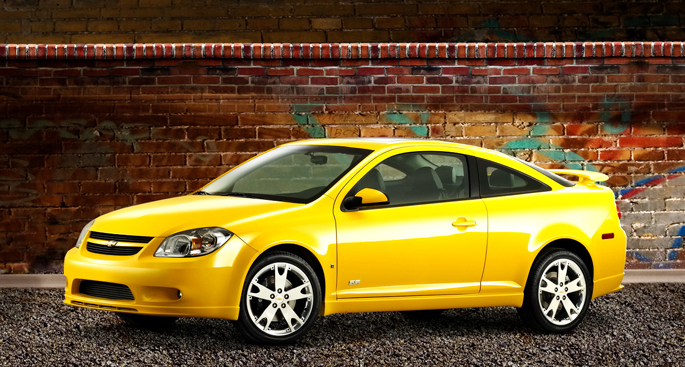 The Chevrolet Cobalt comes in two-door coupe and four-door sedan body styles, and in base, LS, LT, and SS trim levels. The base engine produces 155 horsepower and qualifies the Cobalt as an Ultra Low Emissions Vehicle; these models come standard with a five-speed manual transmission and a four-speed automatic is an option. The base version of the Cobalt is EPA-rated at 25/37 mpg City/Highway with the five-speed manual transmission. The Cobalt SS is powered by a turbocharged 2.0-liter four rated at 260 horsepower and 260 pound-feet of torque. The Cobalt LS comes with urethane steering wheel that fits LS and LT models. The leather-wrapped wheel that's optional on the Cobalt LT is much nicer. Rear-seat passengers pay a price for the coupe's sporty looks. Headroom, legroom, and hip room are reduced by 2 inches, 1.5 inches, and 3.5 inches. Up front, the coupe actually offers more head and legroom than the sedan, but only by fractions of an inch. Therefore, the coupe is a good choice for drivers who are usually alone or with a friend, while the sedan is the better choice for drivers who often find themselves with two or three passengers. A heavy-duty five-speed manual is the only transmission available with the SS. The SS version is available only as the coupe. 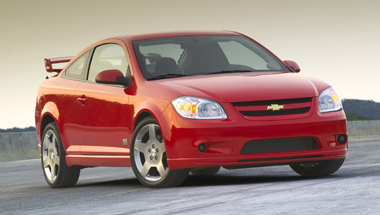 For 2010, Chevrolet Cobalt changes are few. The My Link package includes luxury Chevy Cobalt Accessories, an AM/FM/CD/MP3/USB audio system with Bluetooth connectivity, cruise control, leather-wrapped steering wheel and shift knob, steering-wheel audio controls, OnStar Directions and Connections, and 16-inch alloy wheels. The power sunroof and performance display are standard on the SS model. Rear disc brakes and ABS are optional except on the highest trim levels. Chevrolet developed an all-new FE5 Sport suspension specifically for the SS, including upgraded stabilizer bars, spring rates and damper tuning, for a claimed cornering grip of 0.9 g. Front brakes are from Brembo and have a performance-oriented fixed-caliper design, which resists fade better than floating calipers. Rear discs are vented for better heat dissipation. This combination enabled the Cobalt SS to set a new class record of 8 minutes, 22.85 seconds at the famed Nurburgring racing circuit. As for the sedan, the trunk is wide and deep with a low lift-over height, and almost 14 cubic feet of capacity, more than competitive in the class, though the opening to the trunk seems relatively small. The trunk lid uses outside corner hinges and two hydraulic assist struts instead of gooseneck hinges that can squash groceries when the lid is closed. The coupe has the same trunk volume but an even smaller trunk opening, making it difficult to stow a thick suitcase. A 60/40-split, fold-down rear seat with a trunk pass-through feature adds utility to both sedan and coupe.